While I try my best to get to as many of the books that drop through my letterbox as possible, unfortunately several get squeezed out by later arrivals and end up forgotten and unloved somewhere at the back of my bookshelves. It’s something that causes me the odd pang of guilt, particularly when the book is from a small press hoping for a little publicity, and today’s choice is one of these forgotten souls, a short novel I received a year or two ago and promptly forgot about. 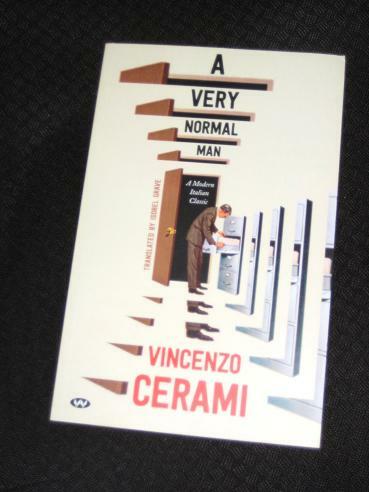 Vincenzo Cerami’s A Very Normal Man (translated by Isobel Grave, review copy courtesy of Wakefield Press) is set in 1970s Italy, where Giovanni Vivaldi, a civil servant working on pension paperwork, is looking forward to his imminent retirement. His joy at the free time he will soon receive is compounded by the hope that his son, Mario, might be able to take his place, as the younger Vivaldi is an accountant preparing to take the entry exam for the civil service. On either side of him score on score of cheap runabouts ripped past at full speed, mounting the curb freely, driving along the tramlines, young thugs at the wheel in a breakneck charge, horns blaring as if they were delivering road victims to Emergency at San Giovanni. When Giovanni gets to work, the situation is no less bizarre. Having managed to escape from the walk of shame of the latecomers, he then goes up to his office in the large, gloomy ministry building – to relax until his boss finally arrives an hour or two later (efficiency doesn’t seem to be highly prioritised in the Italian civil service). Giovanni himself is initially a, well, very normal man. He goes to work every day, enjoys his paperwork and is well regarded at the office. When taking a break with his son, his accountant side shows through in his meticulous organisation, changing the batteries in the old clock there, just in case. Even during the stressful situation of his induction into the Freemasons, he takes his time with the application from, checking carefully for spelling errors. It’s a level of organisation that will hold him in good stead later when it will be very important for him to keep his head. There’s a fair amount of humour in the book, with much of it initially focused on Giovanni’s gloomy work environment. There’s something very British about the quirks and inefficiencies of the Ministry, with the separation of workers and bosses, and the poor man’s ordeals on joining the Freemasons also throw up some clever scenes. In fact, these early parts are deceptive, pushing the reader into expecting a certain type of story, when it actually turns out to be a rather different affair. A Very Normal Man is a clever book in that you’re never quite sure where it’s going. Without wanting to reveal too many of its secrets, there’s a twist almost exactly half-way through that changes the novel completely, from an amusing comedy of manners to a darker tale, where Giovanni tries to recover and prepare himself for the time when he might be able to take his revenge. As all around him first sympathise, and then turn away, he develops a mask that protects him from the outside world while never forgetting the hurt inside, just waiting for a time to deal with it. By showing us the violent environment surrounding his hero, Cerami sets the scene for Giovanni’s reaction to the attack on his comfortable life, and as unexpected as his subsequent actions are, they never seem as unlikely as you might expect. Sadly doesn’t look like I can get hold of this in the UK. I did discover that Cerami wrote the screenplay for Life is Beautiful though. Grant – Yes, that’s not helpful… I had no idea about the screenplay, though! Just looked, and it’s available on the Book Depository (of course, it may show different things when accessed from your neck of the woods…). I read and reviewed this back when Wakefield published it, and found it a really fascinating read, and an indictment of middle-class Italian life at the time. No, you’re right Tony, it isn’t.